If you work for one of the many employers that want to create a more inclusive workplace, but lack the knowledge or creativity to come up with ideas, take advantage of some recommendations from the experts. 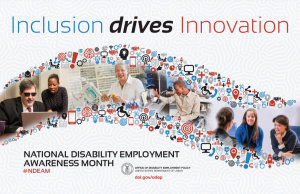 The theme of this year’s National Disability Employment Awareness Month (NDEAM) is Inclusion Drives Innovation, which indicates just one of the advantages of creating a workplace culture that includes diversity of many types, including disability. NDEAM is a fitting time to formally launch disability employment awareness activities — and set the pace for 11 more months of activities designed to promote disability inclusion. Kickoff events can range from large-scale, multi-day celebrations to small brown bag lunches about disability issues. Whatever approach you choose, there are a number of tools and planning resources to assist you in your efforts. Each year, you can use the new NDEAM theme to frame your kick-off event and influence year-round activities. Disability Mentoring Day promotes career development for youth with disabilities through hands-on programs, job shadowing and ongoing mentoring. The nationwide observance is the third Wednesday of each October, but employers may choose to host their own events any day of the year. The American Association of People with Disabilities offers information to assist you in implementing a Disability Mentoring Day. Take advantage of this easy way to connect with great talent while providing young people with disabilities valuable career experience. One easy way to maintain momentum is to host a series of monthly “lunch and learn” events for employees. Just schedule the date and place, enlist internal or external presenters, and invite employees to come learn about a range of disability-related subjects. Topics can often be suggested by your disability-related ERG (if you have one) and can include everything from “Communicating with Job Seekers with Disabilities,” to “Creating Accessible PDF Documents,” to “Managing Diabetes at Work.” Such events are a great way to educate staff about disability issues in an informal setting. And don’t forget to survey attendees after each session to gather feedback and solicit new topic ideas. NDEAM is a great time to freshen up walls and bulletin boards in your lobby, break rooms and common areas with disability employment posters — but there’s no reason to take them down when October ends! Start by putting up the current year’s NDEAM poster, which is available in both English and Spanish. Additional display materials include the Campaign for Disability Employment’s poster series. You might also consider highlighting specific disability recognition months such as Heart Health Month, Epilepsy Awareness Month and Brain Injury Awareness Month to keep the pace going throughout the year. And with numerous, free posters to choose from, you can keep your displays fresh and dynamic throughout the year. The benefit of this practice? Employees who are consistently reminded that their organization is disability-friendly may be more likely to refer job-seeking friends with disabilities to your HR department. In addition, those with disabilities themselves may be more likely to self-identify as such. If your company offers employee development and training opportunities, consider adding American Sign Language classes to your catalogue of offerings. Such classes aren’t just fun; they teach employees new skills while reinforcing relationships between hearing employees and those who are deaf. On-site classes can be taught by representatives from local or national sign language organizations, while external classes are often available at local colleges and universities. This professional development practice can serve to strengthen internal communications for your employees who are deaf, while bolstering your ability to recruit talented job candidates who are deaf or hard of hearing. If your company pays for recruiting visits to college campuses, be sure to have your recruiters contact each institution’s Career Services Office and Disability Services Office to give them a heads up. Let them know that you’re interested in interviewing job candidates with disabilities and brief them on the types of positions available. Regularly meeting with juniors and seniors with disabilities on campus recruiting trips is a great way to build a pipeline of talented job candidates for your organization. One of the best educational events you can provide your employees, during NDEAM or anytime of year, is a “Disability Employment 101” primer. And thanks to the Job Accommodation Network (JAN), such events are easy to coordinate. JAN offers a series of free, ready-to-deliver training modules on a variety of disability-related topics. Titled “Just In Time,” the series can be used to educate your staff members with hiring and managerial responsibilities about issues related to applicants and employees with disabilities. A formal onboarding process helps new employees acquire the necessary knowledge, skills and behaviors they need to become effective members of your organization. As such, it’s also a perfect opportunity to educate new employees on your company’s policies and practices related to disability inclusion — from reasonable accommodation procedures to your commitment to equal employment opportunity. Such practices will help new employees feel good about the organization they now serve, and may encourage self-identification among people with hidden disabilities. What’s more, it may also make them more likely to refer their job-seeking friends with disabilities to your organization. Learn more about hiring a diverse workforce at CareerOneStop’s Business Center.